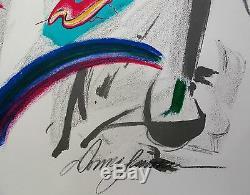 This is a hand signed original lithograph by Donna Summer titled Summer Fever. " from the "Driven by the Music Suite. This piece was hand signed by Donna Summer herself. This subject is pencil numbered from an edition of 750. Published in 2003 on arches paper. Comes with a gallery certificate of authenticity. Donna Summer - A Star on Stage and On Canvas. Many of us have mourned the loss of the original Queen of the Disco era, Donna Summer. Donna Summer, sadly, left us in May of 2012, overcome by her battle with lung cancer, which is a tougher foe to endure than many of us actually get to see in real life. But her final appearances showed her displaying poise and grace, attributes that escape many musical professionals of current day. In her passing she also leaves the art world a string of successes that some may argue were impressive as her work on the stage. Summer has painted for many years, but her initial exhibition of lithographs took place in 1989 at New York Art Expo. Working with world-renowned artisan Jean Pierre Remond, she created fine art lithographs at the American Atelier in Manhattan. 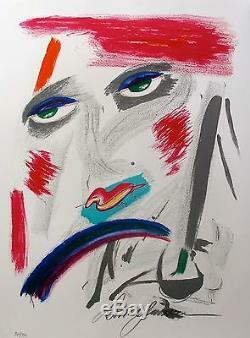 These signed and numbered lithographs were exhibited in one-person exhibitions in Atlantic City, San Diego, New York, Chicago, Beverly Hills and Bal Harbor, Florida from 1990 to 1992. A one-person exhibition of her paintings and lithographs was hosted by the Bennett Gallery in Nashville in 1995, and a show of her work was held at the Tennessee State Museum in 1998. In 1999, her paintings were included in Steven Spielbergs Starbright Foundation Tour of Japan. In 1999, Summer was one of the artists included in the American Century Exhibit at the Whitne Museum in New York. In 2001, Summers art was presented by special engagement at Sothebys. Her artwork has raised contributions for and awareness of numerous charitable causes including: The Bogart Pediatric Research Foundation for Cancer, Leukemia & AIDS, The St.
Jude Foundation, Make-A-Wish Foundation, Project Angel Food/Divine Design, Race to Erase MS Foundation, M. Martell Foundation and The Minnie Pearl Foundation. Her abstract style oil paintings have been described as Post-Impressionism and Neo-Primitivist. The item "DONNA SUMMER SUMMER FEVER Hand Signed Limited Edition Lithograph DRIVEN MUSIC" is in sale since Friday, April 3, 2015. This item is in the category "Art\Art Prints". The seller is "forgottentreasurez" and is located in Sherman Oaks, California. This item can be shipped worldwide. Size Type/ Largest Dimension: 18" x 24"
Size Type/Largest Dimension: 18" x 24"